Previous Story: What Do We Work For? His work had decided that all interviewers with computer knowledge were to take a laptop home from work to get acquainted with the new interviewing software that the company had bought, to use in the field for their next interviewing project. Rosh had been mucking around on it in his office. “Teach me how it works,” said Isha. “Sure,” said Rosh, and closed the interviewing software. But the programme froze and gave him an error message. Rosh tried short-cut keys but nothing happened. “What do we do now?” Isha was afraid. The last thing she wanted was expensive borrowed equipment going kaput on them. “Weep!” Rosh sighed, and pushed the machine away in frustration. “This message is really scary,” Isha said, staring at the cryptic impersonal warning. Rosh noticed the dread in her tone. She was pregnant again, and the last thing he wanted was for her to stress out on something like this. “What is Haiku?” Isha asked. Close all that you’ve worked on. She was rolling in mirth by now. Some of these were real beauties. 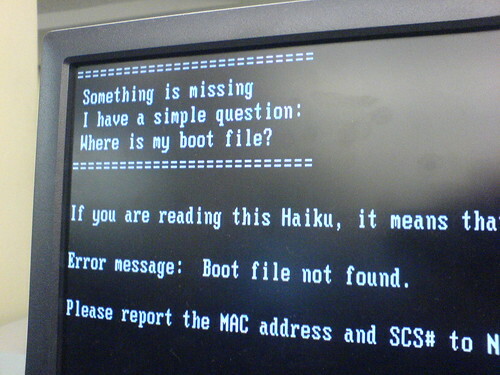 “Have they replaced the computer error messages with their own Haikus in Japan then?” she asked. “What are we going to do about this laptop now?” she asked again, her concern returning.